In one of the albums we have already touched upon most of the buildings on the Stachek Square (near undeground station “Narvskaya”). However the Narvskye Gate and the monument it self were still out of the frame – they were restorated and covered up with scaffold. Now the work is already finished. In 1814 in oder for meeting the Guards regiments from France after the victory upon Napoleon the wooden gate were created on this place (project by D.Quarengi). In summer 1815 the returning troops walked through it. Then this place was called Narvskaya Zastsva. 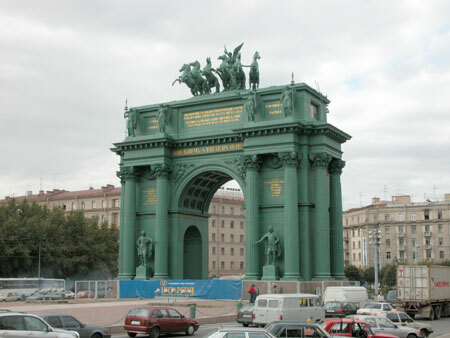 In 1827-1834 the modern gate instead of the old wooden were built (some near to the South) by the project of V.P.Stasov. 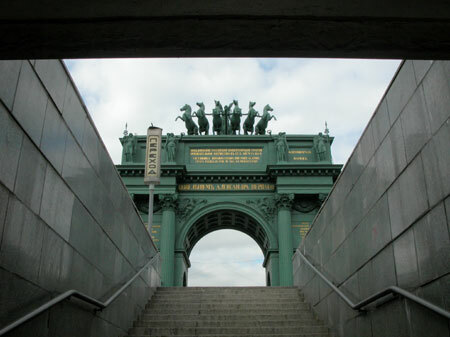 The entrance to the Gate from the underground passage. The undeground passage and the granite podium around the date were erected in 1979-1980. 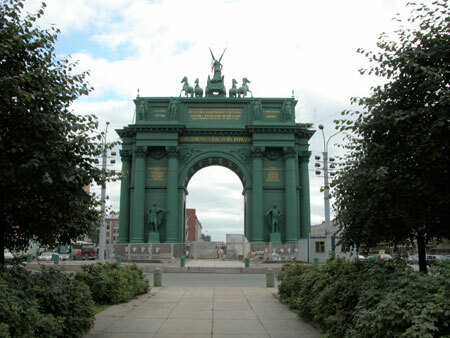 In front of the date approximately on the way of the underground passage earlier flowed an arm of the Tarakanovka river (it was filled up in 1929) through which led a stone double-span bridge got up in “Victory style”. 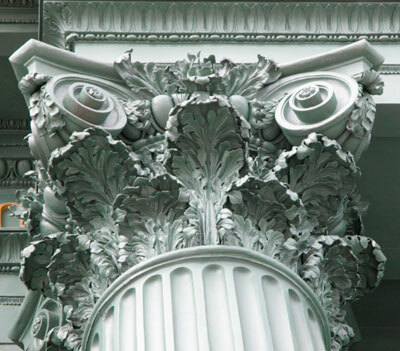 It’s banisters were copied in the “Second Sadovy (?) bridge”. 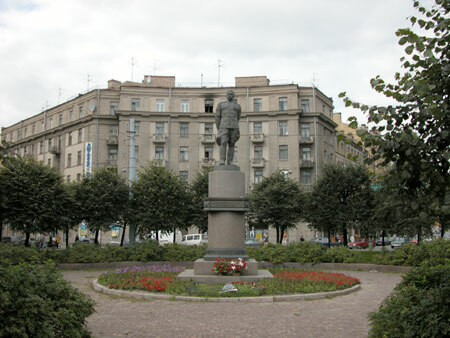 A part of the square near the gates is paved with a red cube – in a memory of the Bloody Sunday of January 9, 1905 (when the government troops shot here the workers) and also about that from this place in 1917 the Red Guard people (from Putilovsky and other local plants) went to defence Petrograd and in 1941 the regiments of the First Kirovskaya division of the citizen army formed here. 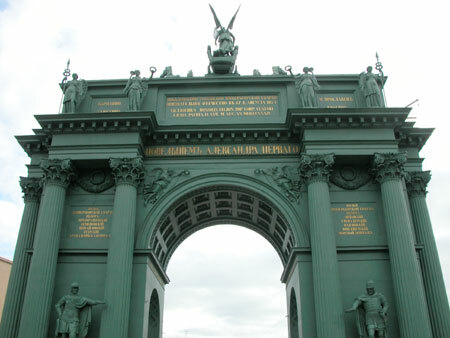 “To the victorious Russian Emperor Guards grateful motherland in 17-th August day 1834. 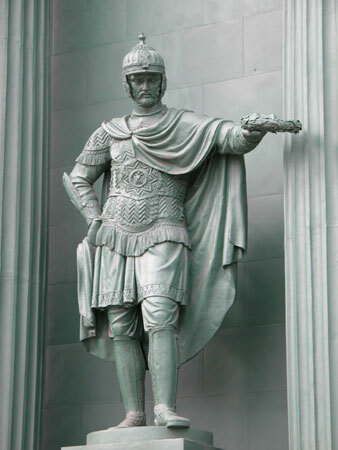 VICTRICIBUS ROSSICIS LEGION. IMP. CORP. COSTOD. GRATA PATRIA.D.XVII.M.AUG.AN.MDCCCXXXIV." 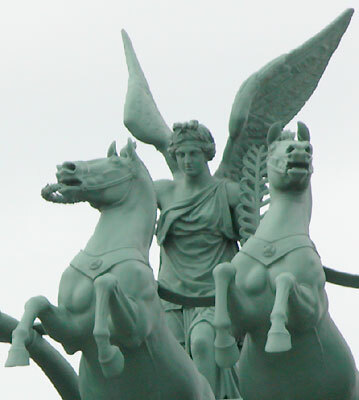 On the height of 15 meters-the triumphal chariot of the Victory from the forged copper. 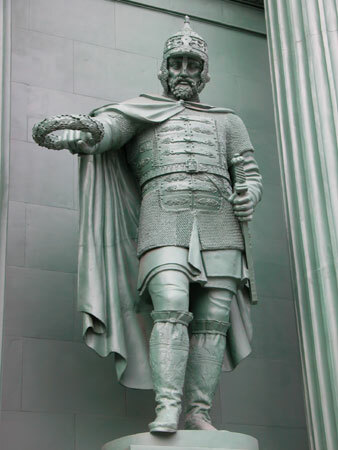 Sculptures – P.K.Klodt, V.I.Demut-Malinovsky, S.S.Pimenov.. 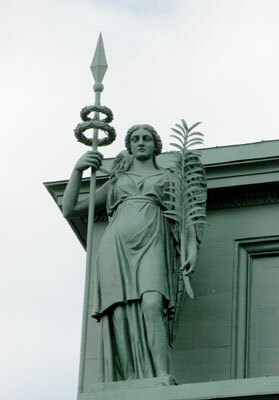 In the chariot – Nika-the goddess of the victory with a palm branch and a laurel wreath-the symbols of peace and glory. 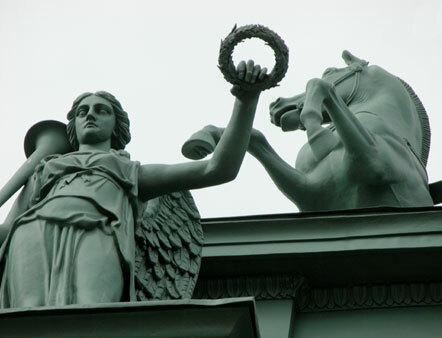 The warrior figures in ancient russian armor with the laurel wreathes (sculptures-S.Pimenov, V.Demut-Malinovsky). 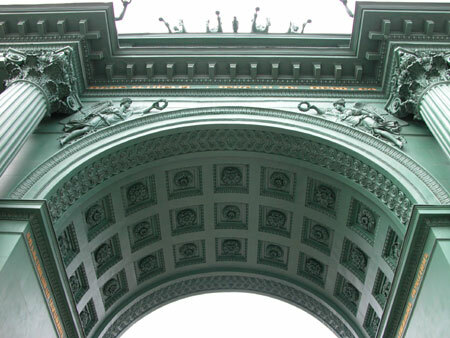 The Gates were made from bricks and panneled with copper sheets (near 90 tonnes of copper). Inside the Gates just above the arch-small military historical museum. 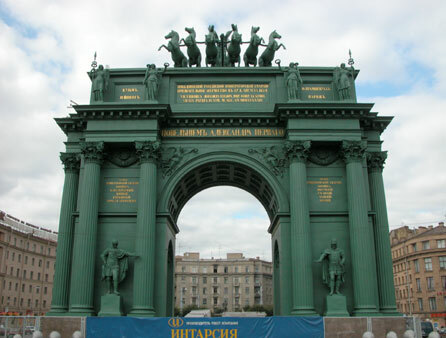 The idea of it’s foundation belongs to V.P.Stasov who had projected the Gates itself . But the idea was realized only in 1989. 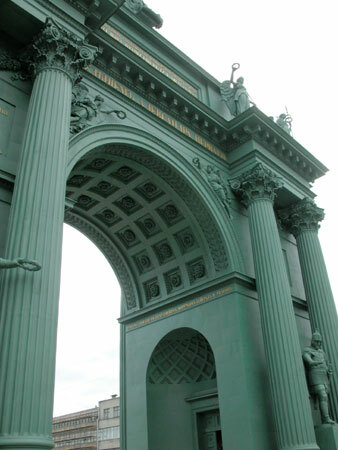 The Gates were on restoration in 1927, 1951 (were hardly harmed because of the fires), in 1978 and now – approximately 2000-2003. 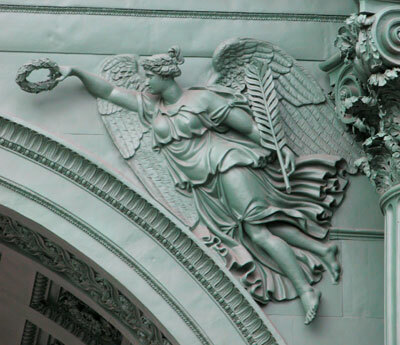 To the left and to the right, above the arch, if I’m not mistaken – the Geniuses of Peace. 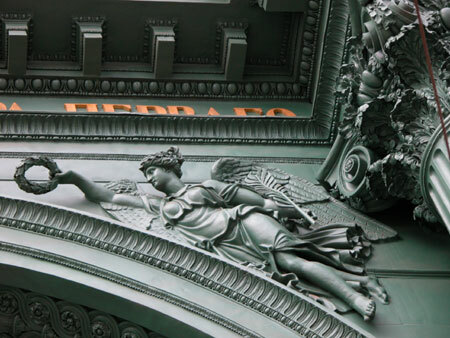 Sculptures – M.G.Krylov and N.A.Tokarev. Let’s look at the Gates from the other side. The writings in the centre are the same, but on the edges-a new one. 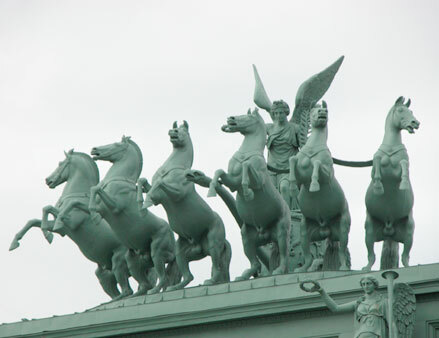 To the left and to the right below – the names of the regiments. 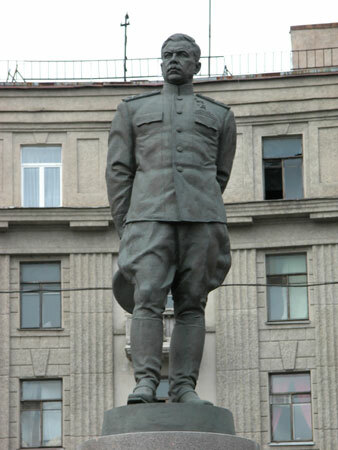 In front of the Gates-the monument to marshall and hero of the Soviet Union – Leonid Alexandrovich Govorov. 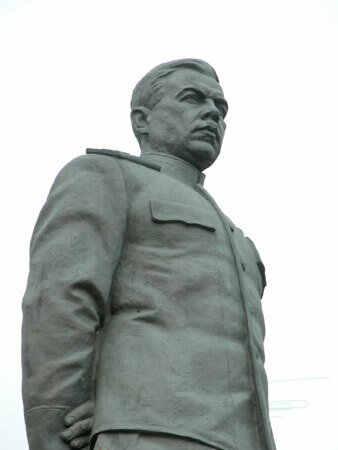 In April 1942 L.A.Govorov was set to command the group of the Leningrad front troops , he has passed the Great Patriotic War and was rewarded for many times. After the War he headed the PVO troops of the country. 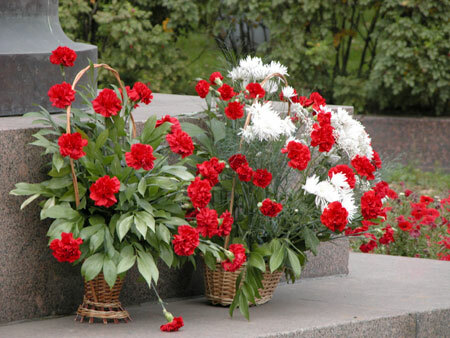 He was buried in the Kremlin wall on the Red Square. 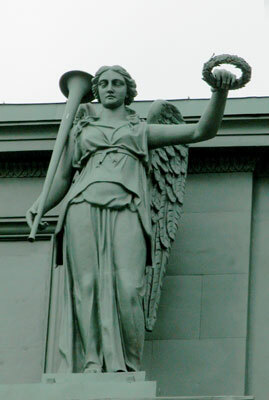 The monument established in 1999 by the model of sculptor V.Bogolubov from 1946 (he made it in the time of the general commander). 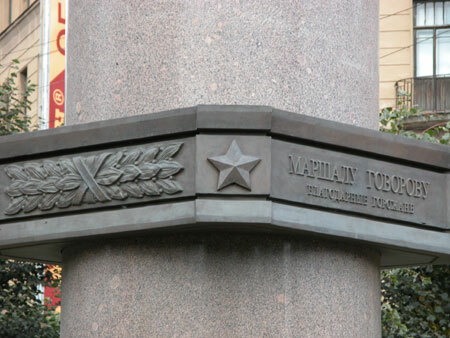 Some inclined to believe the monument wasn’t established earlier because of the “Leningrad file” by which in the time of Stalin Govorov for some reason passed. But such version does not joint with the fact that even in 1962 on of the streets not so far was called in the name of Govorov. 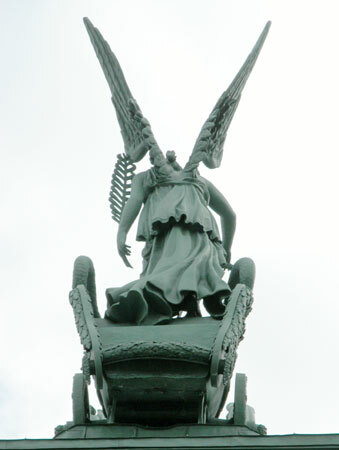 So they had no time or no money to finish the monument. The flowers on the pedestal. 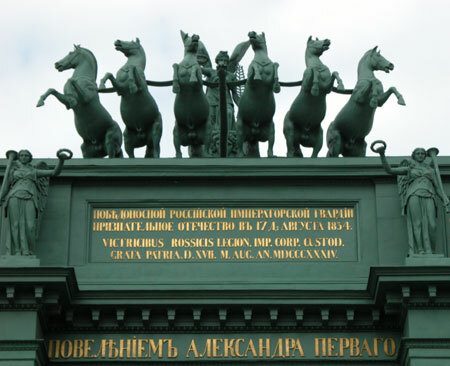 It’s interesting that the Moskowsie Gates (which we will see sometime) were projected by the same architect – V.P.Stasov.